The downtown streetcar project has been out of the news for a while, but momentum continues to bubble both by planners and those who want to stop future expansions of the project. For instance, the city will soon make a major purchase, according to Ald. Bob Bauman, one of the streetcar’s biggest supporters. “I expect we’ll be placing an order for the rolling stock probably within 30 to 45 days, the actual vehicles. That’s a major financial commitment and it will indicate to everyone yeah, we’re really serious about this,” Bauman says. Bauman says the city plans to order four vehicles for the initial phase of the project. That starter route will cover a two-mile stretch extending from the Intermodal station downtown, into the Third Ward, and north to the east side. The cost is $124 million. To pay, the city will use federal money, plus create tax incremental financing districts. Initially, the city wanted to break ground by year's end, but planners have pushed back the date until spring of 2016. Bauman says the streetcar couldn’t come at a better time, now that there are plans to build a new Milwaukee Bucks arena and entertainment complex. Bucks’ President Peter Feigin praises the idea of new downtown transit and the city’s phase-two plan to extend the line to the new sports center. “I think the importance of transporting people and getting people to the destination is paramount. How do we drive traffic, how do we bring people in, in a lot of different ways,” Feigin says. The project faced significant opposition on the Common Council before it passed the plan in February on a 9-6 vote. The newest member, Ald. Mark Borkowski, opposes the streetcar. He fears it’ll see a flurry of riders at first, then decline. “You can see the trolleys during the summer days and nobody’s using them. So, they’re going to say now we have to go up to UWM, or we have to go to State Fair, or we have to go to Potawatomi, or we have to go to Miller Park. That is the huge battle, whether or not we expand and that would be disastrous just simply from a dollars and sense standpoint,” Borkowski says. 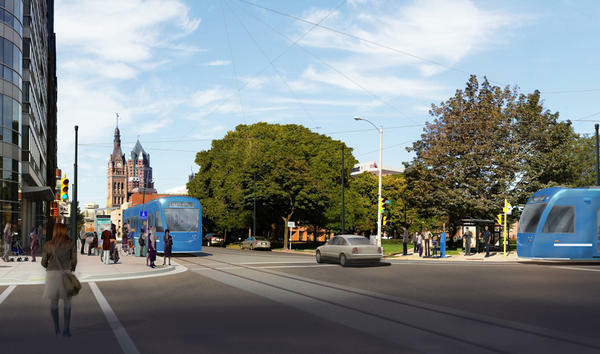 Borkowski says he hopes to influence any future votes that would expand the streetcar’s reach. He’s also supporting a slate of candidates planning to run for the council next spring, against members who backed the streetcar. Another person interested in continuing the fight is Craig Peterson of the group, Stop the Streetcar. Earlier this year, Peterson organized a petition drive to put the streetcar issue to voters in a binding referendum. The effort failed, but Peterson believes voters will be fired up come April’s election. “From the polling information I’ve seen, darn near three quarters of the voters in the city are opposed to it. When you have a government that just runs amok and does not listen to the people and goes against the wishes of voters, you’re going to have an uprising,” Peterson says. Peterson plans to help candidates who will fight the streetcar. The conservative group Americans for Prosperity may also lend a hand. It has opposed streetcars in other cities, insisting they are an unnecessary use of taxpayer money. A spokesman for the Wisconsin chapter says the group may run an issue ad in the Milwaukee market early next year. Members of the Common Council will hold a meeting Friday at City Hall to update the public.